Home » News » The story behind our antique red truck…. We recognized being on a major road with a 55mph speed limit we would need a sign that would stick out. A regular sign wasn’t going to be memorable enough, so we decided to find an antique truck. Jesse did some searching and found the 1950 Chevy 6400 heavy duty truck sitting on a farm field in Minnesota. The truck is still a working truck and even has a dump bed. The farmer who sold us the truck was kind enough to work on helping schedule delivery. One of his friends was a trucker and was scheduled to stop in Buffalo. He told the friend the truck needed to go to Wilton and the friend said, “that’s close enough” and included the truck in his delivery route, adding Wilton as a delivery location. 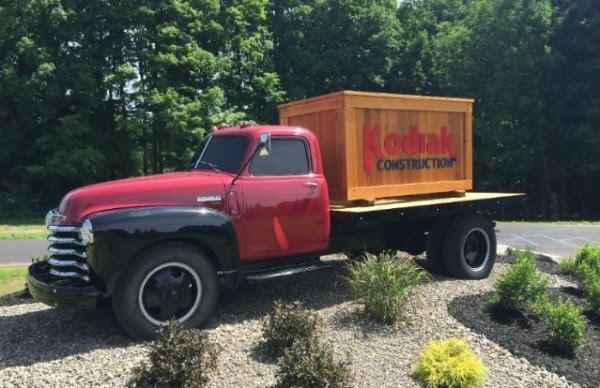 Garvey Autobody in Queensbury stripped the truck down and painted it red to match the color of the Kodiak Construction logo. Found inside the truck were steel tie-downs that were original to its days as a work truck. Those steel tie-downs were used to anchor a crate to the back. The truck is staged in front of the Kodiak office as if it’s delivering the crate with Kodiak’s logo on it. The Town of Wilton considers the truck a sign and they only allow for “fixed” signs, so if you look closely, you will see steel posts underneath. These anchor the axles to the ground making the truck a fixed sign. Look for our truck next time you’re traveling on Route 9!